I was saddened to receive the news this morning that Violet de Cristoforo had died on October 3, at the age of 90. I had not been in touch with her for a long time, and I felt some guilt for not continuing communication over the years. For some years, Violet had sent a small gift to me each Christmas, which I had followed with a telephone call or note. Her death reminded me of the day in 1995 when I received a baggy monster of her manuscript in the mail. The book, a collection of Kaiko Haiku written in the Japanese internment camps in California and elsewhere during World War II, was a mix of historical information about the internment, descriptions of the art and poetry done in various communities before the war and within camps during World War II, and brief comments on the various camps throughout the American West. While extremely informative, it was poorly organized and was unpublishable in its original state. I telephoned Violet, who invited me up to her home in Salinas where I had dinner with her and her husband, Wilfred de Cristoforo, staying the night and talking with her much of the next day. I suggested that, without abandoning the important historical contexts of the volume, she refocus the book on the haiku itself, beginning with the various pre-war groups and following them into the camps, providing the information on the internment and the concentration camps themselves before presenting the substantial selection of poems which she had translated. I also suggested that she attempt to give short biographies of each figure, even though much of that information was now unfortunately lost since many of the poets had returned to Japan and others had died. Violet, who had spent much of her life writing this work, and who had dedicated herself to disseminating information about the Japanese internment—often in opposition to the Japanese community itself—was quite obviously overwhelmed by the changes I had suggested. Through that first evening and much of the next day, she attempted to explain, with the stories and texts she put before me, the difficulties of camp life and the terrible effects it had had on her and her husband’s own lives. Born of immigrant parents, Violet spent her early life near Hilo, Hawaii. 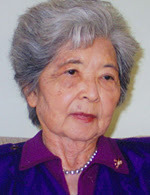 From her birth in 1917 until her family’s return to Japan in 1924, she attended a Japanese Language School. When they returned to Hiroshima, she was enrolled in the Danbara Elementary School. In her mid-teens her family decided that she should have an American education, making arrangements for her to move to Fresno, California, where she stayed with the Stuart family, who raised her as their own daughter. Upon graduation she married Shigeru Matsuda, a charter member of the Valley Ginsha Haiku Kai and a practicing Kaiko (freestyle) Haiku writer. With her husband, she ran a Japanese language bookstore in Fresno. She had two children, Kenji and Reiko, with whom, in 1939, she traveled back to Hiroshima for a visit to her mother, gaining further knowledge during her visit about the fine points of Haiku. When she returned to the US just prior to the outbreak of World War II, she was startled to learn that the family bank accounts had been frozen by the US government under the Enemy Alien Act. While expecting her third child, she and her family—subject to the signing of Executive Order 9066 by President Franklin Delano Roosevelt—were forced to abandon their home and bookstore and were relocated to the Fresno Assembly Center, where she gave birth to her child over an orange crate. At war’s end in 1946 Violet was expatriated to Japan, returning to the bomb-scarred Hiroshima where both her father and mother had died in the explosion of the atomic bomb. Her husband, she discovered, had remarried. In order to support herself and her children, she worked concurrently in three jobs, paid by the Americans in the devalued yen instead of dollars. In 1956 she met and married American army officer de Cristoforo, with whom she returned the United States, where he attended the Army Language School while she began working for the educational division of McGraw-Hill. But even then, her past seemed to haunt her and her new husband. Both told me that they believe he did not receive military advancement because of his marriage to Violet, which information obtained through the Freedom of Information Act seemed to confirm. Now, perceiving her complete immersion in these experiences, I suggested that she simply send me more information, photographs, and other materials, and I would reedit and reorganize the manuscript myself. Fortunately, I had a gifted intern at that time, Elaine Cress-Piechowski, who worked dedicatedly on the project, and was able even to match the Japanese with the English translations. Working hand in hand with my typesetter, Guy Bennett, she shaped, with my suggestions, the book into a coherent whole. In 1997 I published May Sky: There Is Always Tomorrow—An Anthology of Japanese American Concentration Camp Kaiko Haiku in a cloth edition, a book I am very proud of having produced. Although the book received some critical attention, the major newspapers and magazines, to my amazement, did not bother to review the work. Clearly there was some confusion over whether this was a history of the Japanese Concentration Camps or a collection of Haiku; it was both, I tried to explain, but book editors often can only comprehend books that fall into standard categories; and, I suspect, that if they sought any guidance from Japanese scholars or critics, Violet’s outspoken history did not help the matter. I called book editors across the country, sent copies of the book to the newspapers of every major city—not one of them responded! Although there have been several studies now on the shameful incarceration of Japanese Americans, there had never been a book that explored the issues from this perspective. Evidently, those in power still did not want to face the past! I am pleased, however, that many of the poems have been anthologized in poetry collections of American writing. An individual from the California State Historical Society recently told me how important he felt this book had been. He had only to thank its courageous author, I responded, a woman who lost everything before recovering her powerful voice. Thank you for this blog, Douglas, Messerli. April 2014, Poetry Month, a good time to honor the work of Violet Kazue de Cristoforo.